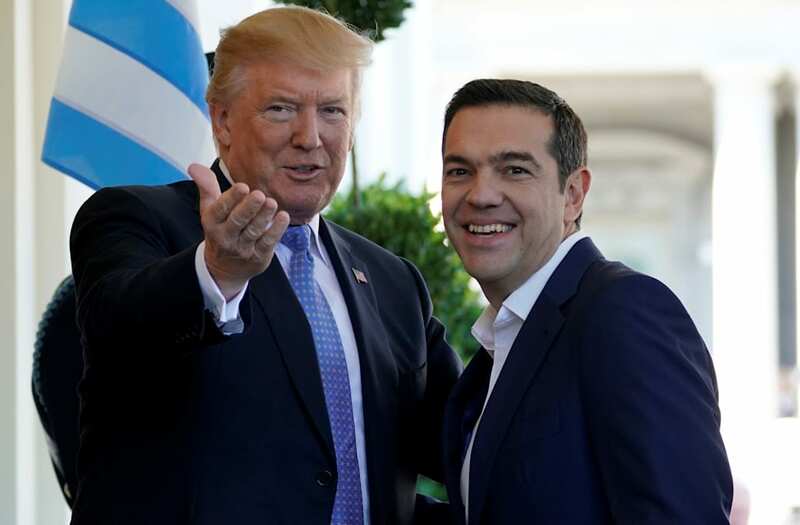 As he stood feet away from President Donald Trump in the White House Rose Garden on Tuesday, Greek Prime Minister Alexis Tsipras tried to downplay his former comments calling Trump "evil." During a press conference, Fox News' John Roberts asked Tsipras to reflect on his comments from March 2016, in which he said he hoped "we will not face this evil," referring to a potential Trump presidency. "I wish I knew that before my speech," Trump quipped after the question. Tsipras described the US as "a very strong power," and broadly praised US intervention abroad, dodging Roberts' question while affirming Greece's general commitment to common goals with the US. "I am very optimistic after the meeting we had today," Tsipras said. "The meeting we had was very productive, not a moment did I feel threatened at any time," Tsipras said. "I saw that there is a very fertile outlook here in order to set aside any differences we may have here to find the common ground which is very important to the relationship." Though Trump once called the country "unsalvageable" because of its campaign debt, on Tuesday, the president praised Greece's recovery, as it underwent harsh austerity measures including spending cuts and tax hikes in exchange for a bailout from the European Union.